Brett Caron (@brettcaron) has now penned two phenomenal works of fiction within the Star Traders universe, giving unique and gripping life to new perspectives of what it is like to be a Captain, an officer, or a lowly crew. 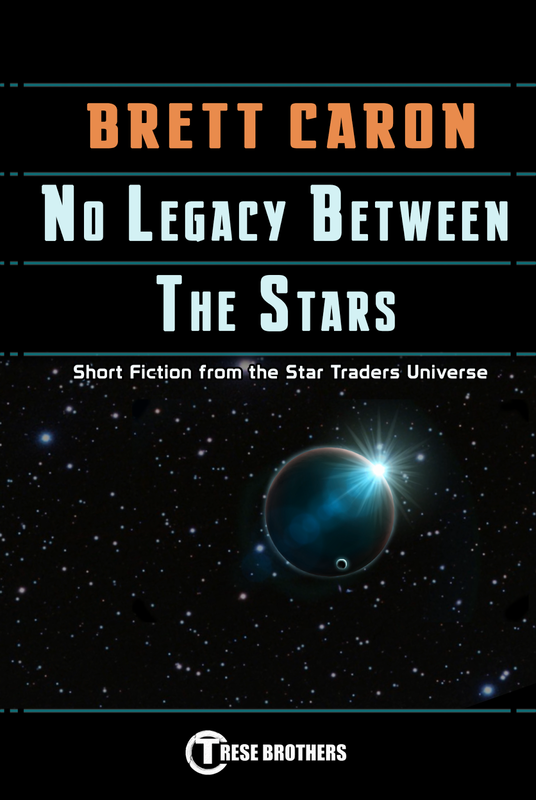 The larger-than-life Star Trader Captains dominate the story arcs and drive the major action, but the real stories being told are more human, more personal, and tangled up in the web of relationships, love, and hatred among the stars. We had the pleasure of sitting down with Brett (digitally) and learning more about his history as a writer, where he finds his inspirations, and what he will do next. 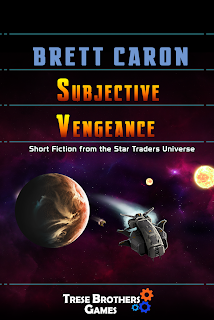 Download Brett's works, Subjective Vengeance and No Legacy Between the Stars for your device today! When and how did you get into writing in the first place? Brett: My first writing job was as a contributor to andPOP’s Gamer’s Mind Blog. I worked with a great editor named Josh Salem, and got a bunch of free games as part of my reviews. It was a lot of fun, and I had a great time writing about video games. But when I look back, I see writing all the way back into my childhood. My favourite assignments were all short stories or the like, and I was very protective of my scores on those. I remember getting into a very loud argument with my 7th grade teacher over whether ‘Writ’ was a word after I used it in a story title. She was not happy to be proved wrong, but I was rarely on good terms with most of my teachers. You've now given your readers a unique look into the lives of an Explorer Captain and a Bounty Hunter -- what do you think will be next? Brett: Well there’s so many places to go in the Star Traders universe. I like to keep mixing it up, but what I’ve been doing is focusing on a story I’d like to tell and then figuring out who will be telling it. Even though both these stories feature Star Traders, they both revolve around members of the crew. I like the idea of a Star Trader being a larger-than-life character in this universe, just as the players are above and beyond the characters they see onscreen. 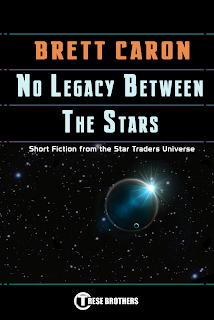 When you're not working on telling tales within the Star Traders universe, what else have you been writing? Brett: I try to keep busy. Right now I’m working with Palladium Books on a few different projects; last year I was an editor on their new Chaos Earth: Resurrection book (the most original take on zombie apocalypses I’ve seen in a while) and I’ll be at the Palladium table at Anime North on May 27th-29th in Toronto. Other than that, I’m in the process of getting a book of short stories published, which is to say I’m trying to figure out if self-publishing is worth it over traditional publishing routes. I’m also outlining a couple of screenplays, and talking about coming on as an editor for an autobiography. Both Subjective Vengeance and No Legacy Between the Stars have some great twists in their plots -- how do you come up with those? Brett: I’ve played a lot of tabletop games over the last 15 or 20 years, which is actually another way I’ve had writing in my life. What I’ve learned from these games is: if you’re the Dungeon Master or GM, and you plot out a perfect story with all the details just the way you want them, the players are invariably going to run your special snowflake ideas right off the rails. It’s the same with writing - I’ll have this story in my head, but by the time I’m near the end I start to think, “wait - this character wouldn’t do that. She’d do this,” and it blows apart my carefully-crafted plot. Sometimes that breaks the story and I have to rewrite. Other times, it becomes the foundation of a twist - if I didn’t see that coming, would the other characters in the story see it coming? The point is that any twist is a result of identifying and subverting expectations. Any exciting new gaming or fiction that has caught your eye and you'd like to recommend your readers try out? Brett: The Kickstarter for the Savage Rifts RPG has just finished, and I’m really excited for that - I need to go learn the tabletop system, but I think it’s going to be great. Some of the stuff coming out of Black Library for the Horus Heresy series is pretty cool, I’m a big fan of Aaron Dembski-Bowden. I’ve heard that Altered Carbon is being made into Netflix season. That’s a book I’ve been meaning to read, although it’s not exactly a new release. Maybe readers can recommend something to me! What was the thing that drew you to Star Traders RPG the most? Brett: I liked the collection of influences I see in Star Traders, and the fact that there’s a lot of space between what’s already written (no pun intended) to add your own flavour to your Captain and ship. The casual nature of the gameplay appealed to me, since I’m busy most of the time and can’t get too involved with a game before I have to stop and do something else. It makes it easy to build a great character 5 or 10 minutes at a time. My favourites depend on my mood - right now that’s Able Gone, a crafty Smuggler, and Ty Ponderogus, a full-on mad dog Pirate.